When Nicole Greene's friend plucked a tick from her head back in 2001 and flushed it away, she thought nothing of it again until six years later when her doctor told her she had Lyme disease and asked if she'd been bitten by a tick. "I'd never heard of Lyme disease. All I could think was, 'No, I'm not an outdoor person, there's no way I have that,"' Greene wrote in her blog this week for the U.S. Department of Health and Human Services, where she is deputy director of the Office on Women's Health. Driving home from the medical appointment, she remembered the seemingly minor incident from years before. "My older son used to go to a sleep-away camp and there were parent weekends. I went on a parent weekend and at the time I had long curly hair and I assume that's when the tick attached itself to me," Greene told CBS News. Some time later, she was visiting the friend. "I must have felt something on my head and said, 'What is this?' And she called her mom who was a nurse and her mom told her to get the tweezers and get it out and flush it. It was all of two minutes," Greene said. "I never even saw it. I did not know about ticks, and I definitely did not know about Lyme disease." In the months and years after that, mysterious health issues began cropping up, becoming more serious over time. She experienced achy joints, foggy thinking, depression and shaky hands, to name a few. Despite her efforts to pinpoint a diagnosis, the reason behind the symptoms didn't become clear until after a flu-like bout in 2007 that left her bedridden for weeks. Her doctor tested her for a slew of conditions - lupus, sickle cell disease, fibromyalgia, chronic fatigue syndrome and Lyme. The Lyme test came back positive. Greene is one of many people who don't notice early signs of Lyme disease, brush off the symptoms, or whose medical providers missed the symptoms, which often include fever, headache, fatigue, and a bull's-eye skin rash called erythema migrans, considered the hallmark of the disease. It appears in about 70 to 80 percent of infected people, according to the U.S. Centers for Disease Control and Prevention, although some doctors believe many more cases lack this obvious sign. If Lyme is caught early, it can be treated with antibiotics. But if it goes untreated, the infection can spread to the joints, the heart and the nervous system, which explains some of Greene's symptoms. Patients may suffer with severe headaches and neck aches, heart palpitations, facial palsy, and arthritis with severe joint pain. A tiny tick, about the size of a mark a felt-tip pen makes, transmits Lyme disease to humans -- specifically, a bacterium called Borrelia burgdorferi. "The tick is so minuscule, the majority of people don't remember getting bitten by it," Dr. Neil Spector told CBS News. Spector, a cancer researcher at Duke Medicine, went undiagnosed with Lyme disease himself for four years in the 1990s. 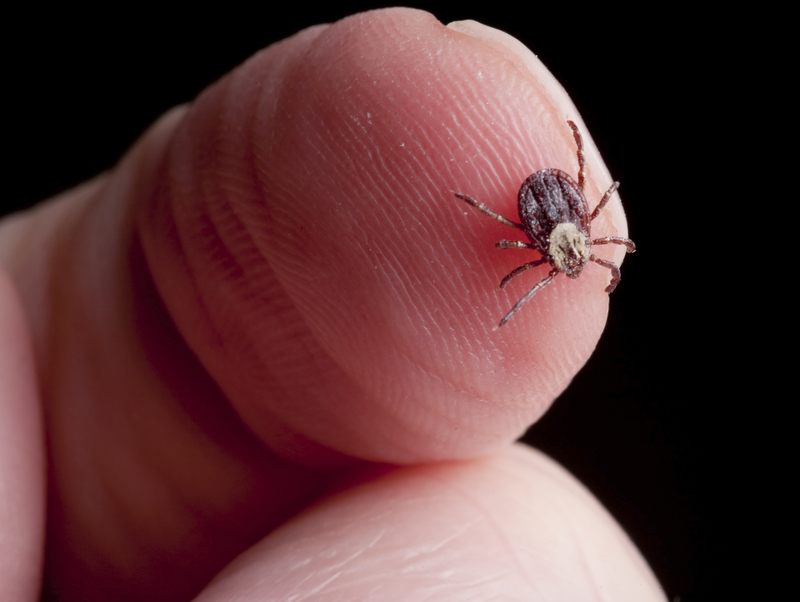 Ticks pick it up from other warm-blooded animals such as deer, mice and foxes, explained Dr. Bruce Farber, chief of infectious diseases at North Shore University Hospital and Long Island Jewish Medical Center in New Hyde Park, New York. There are about 300,000 Lyme infections in the U.S. each year, the CDC estimates, but only about 30,000 cases are confirmed and reported. People living in New England, the mid-Atlantic states and the upper Midwest are at the biggest risk. "It's endemic on Long Island, Cape Cod, Block Island, Shelter Island, and certain parts of Colorado," Farber told CBS News, highlighting areas where ticks are known to harbor in woods and grassy areas. Actor/songwriter Kris Kristofferson is among those who suffered from Lyme disease symptoms for years after being misdiagnosed. His wife told Rolling Stone she believes he picked up the infection from a tick in the woods in Vermont while filming the movie "Disappearances" in 2005. His neurological and memory problems were mistakenly blamed on Alzheimer's, she said. Spector wrote a book about his own medical odyssey of trying to find answers to his constellation of crippling symptoms. He had moved from Boston to Miami at the time, where doctors were less familiar with Lyme disease. "I think the problem is, one, there's this dogma that everyone has this perfectly concentric rash that looks like the Target logo or that people should remember getting bitten by a tick. That there's this very algorithmic set of signs and symptoms and that is actually far from the truth. Depending on which theories you believe, as many as 40 to 50 percent of people don't have that perfect rash," he said. The rash may be hidden in the scalp, which might have happened in Greene's case. Some may have something like contact dermatitis or hives, said Spector, and "dark complexioned people may not see anything at all. If you only look for rash you're missing the boat on a lot of people." Undiagnosed and untreated, Spector went from running marathons to barely being able to walk down a hallway at work. He suffered joint pain, heart palpitations and what he called "brain fog." He went to the emergency room and tests were run but they came up normal. He was told the move to Florida had probably worn him down, caused stress. But he wasn't convinced. As a physician in training earlier in his life, Spector said, "I had worked 130 hours a week in a very intense environment and had never experienced anything like that. I was 37. I didn't smoke, was an avid exerciser. No family history of heart disease. There was no reason I had anything going on in my heart or brain." A few months after moving to south Florida, he said the fatigue became profound, "to the point where I could barely walk 10 yards without having to stop. I went from running 10 miles a day to barely walking 20 yards." He began to suspect Lyme, but he was urged to manage stress, so he tried biofeedback, more time outdoors and mediation, but the symptoms persisted. "The arrhythmias became a bit more complex," Spector said. He soon needed a pacemaker/defibrillator. A first Lyme blood test had come back negative for Lyme disease, but when Spector became convinced he had Lyme and read about the inaccuracy of some lab methods for detecting Lyme, he insisted on further testing. Finally, Lyme was confirmed in 1997. "I was incredibly relieved to know it wasn't all in my head," he said. He was given powerful antibiotics through an I.V. every day for three months to rid his body of the Lyme disease bacteria, sitting alongside his cancer patients who were receiving chemotherapy. He moved to North Carolina in 1998 to work on cancer research at GlaxoSmithKline, but serious damage had already been done to his heart and eventually a heart transplant was required. Delayed diagnosis has taken a mental and physical toll on Nicole Greene's health, too. She missed out on some personal and family events, has had to take time off work for a myriad of medical appointments, and had to pay when insurance wouldn't cover some Lyme specialist appointments. Now, 15 years from when she was bitten, her body is still getting back on track, she said. "What has helped is a combination of traditional and non-traditional medications. And changing my diet," Greene explained. "I have blood work done every four weeks. I don't stay on any one drug for long periods of time. The impact that medication has on your body is tremendous." She said working in the health field has been helpful for her. "Working in this particular office has been a blessing. Because we're in women's health, we are the caregivers. I have a lot of caring," Greene said. Her advice for other patients is to ask questions again and again to get answers that satisfy, and "surround yourself with caregivers, whether it's your practitioner or loved ones." "No one knows your body better than you do"
It's not clear how many people suffer from what the CDC calls "chronic Lyme disease," also referred to as "Post-treatment Lyme Disease Syndrome." Similar complications and autoimmune-type responses can happen following other infections, such as strep and chlamydia. According to CDC experts, research has not shown that patients who go on prolonged courses of antibiotics do better in the long run than patients treated with a placebo. "Certainly untreated Lyme could do unusual things. It can cause chronic arthritis, encephalopathy [chronic cognitive problems] and heart problems. But I don't want people to think that this is common. It's quite unusual," said Farber, the infectious disease specialist. "For the overwhelming majority of people who have Lyme disease, it's been diagnosed and treated, and even when it's not diagnosed, they don't go on to develop those symptoms," he stressed. Spector, now an associate professor of medicine and of pharmacology and cancer biology at Duke Cancer Institute, has been able to return to a more active lifestyle again. While his chronic health issues did not stop him from working on developing a new class of breast cancer drugs and a new medication for children with leukemia, he is happy to be back to other activities like running. "I feel great today. I've been running again. Last year I ran three half-marathons. My cardiologist said at my seven year [post-transplant] evaluation, 'I'm hoping you'll die of something other than heart disease,'" he said. Spector's book about his story, "Gone in a Heartbeat: A Physician's Search for True Healing," encourages others to take charge of their health. "I think people have to trust themselves. No one knows your body better than you do. I don't care if they have a degree from Yale or Harvard. If what you're hearing from your doctor is not in line with what you are feeling, you've got to find somebody else -- advocate for yourself or you can easily fall through the cracks. It's your life," Spector said.